Often times you come across a book which you carry everywhere. 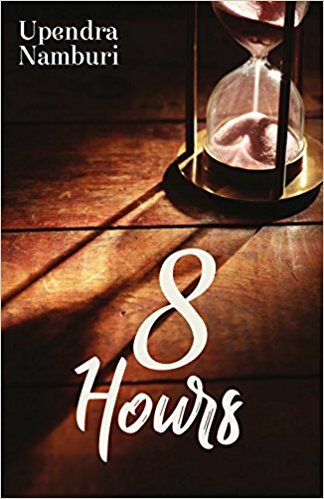 Because you need to know what happens next; 8 hours is one such beauty. The story is of posh people, staying at a posh place and taking big; also doing big. It takes some time to get in the skin of the tale, it takes time to understand where all this is heading to but when you are into it there is no turning back. If I talk in brief without giving any spoilers, the story is about a firm which needs some repairs in the next 8 hours and by repairs I mean some serious ones. How the tale twists and turns, who plot against whom and who come clean is worth seeing, it’s a glamorous show of power. Characters were in abundance ranging from mere pawns to the real big showman’s. There were villains and villains, some bad for someone and some very bad for someone. I didn’t love any of them because not much was told about them, it was there story not there real selves which was projected. I liked Siddhartha, Aratrika, Aratrika’s father, Prince Said and some more people who come and go in jiffy. The plot was amazing. It was the one thing that held the book together, there were so many minute details so many pickup points that a great execution was must and the author was able to show the same. The placing of events around the 8 hours through which the story moves is commendable. I never missed a beat or felt off radar. The environment of the book could have been better, the background setting too. I felt the story just started and ended, there could have been some bridging gaps. The little flashbacks were good but weren’t enough. Externally too the book is appealing, the blurb, title, cover, font, quality, editing; everything was taken care off with precision. There was no flaw in the writing but there was also no extra punch. There was a lack of something quirky, something edgy which could have helped the book to become unforgettable. Summing up- The book was a great surprise, an extremely quick read and a page turner in true sense. It can be a great weekend escapade. There was but something off beat. The story started and finished. There was no spark. But all in all a good read. I can recommend it to those who are into suspense and thriller novels. A digital & marketing professional by day, an engineer & MBA by accident. Upendra is married and has a son. Upendra was first bitten by the writing bug when he was invited to write for one of India’s leading finance dailies. It soon turned into a love affair that turned him into an avid blogger and finally made him take the plunge into the unchartered waters of the Novel. Upendra now takes complex subjects like banking, consumer goods, mergers and acquisitions and turns them into nail-biting thrillers, making those dull and dreary numbers come alive. But he really hasn’t shifted his focus as such, for he still thinks of his books as numbers: 31, 60 and 8. 8 Hours is the third book in the Numbers series.